The Embraer Phenom 300's performance, comfort and technology have all gained attention of many business jet charter companies around the world. Many companies are now adding the Embraer Phenom 300 to their fleet. 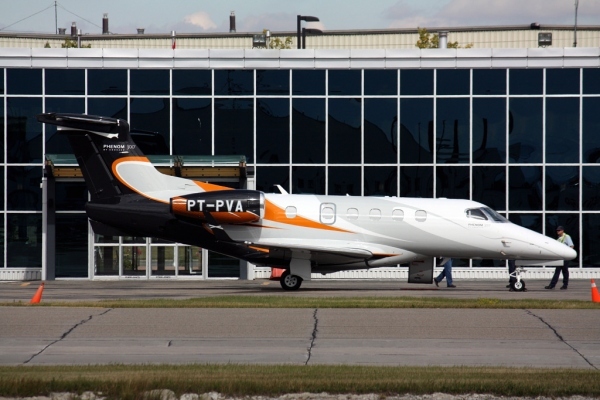 Below is a list of some of the Embraer Phenom 300 Charter operators that Sun Airlines has found. All the Embraer Phenom 300 Charter operators below operate their own aircraft and are not Embraer Phenom 300 charter brokers. Also the Embraer Phenom 300 charter operators listed below are located in the United States, unless noted. If your company offers Embraer Phenom 300 Charters contact our Aviation Resources Team to learn how your company can get listed here. Also if your company is listed here and you would like a link back to website contact our Aviation Resources Team to learn how you can get a link to your site. Another option for flying in an Embraer Phenom 300 is to purchase a Embraer Phenom 300 Fractional Ownership. The companies that offer Embraer Phenom 300 Fractional Ownership programs are listed above. Above Embraer Phenom 300 Charter Photo by Wee in YYC on Flickr. Photo (only) released under a Creative Commons License. For reference: An Embraer Phenom 300 Charter is also known as an E55P Charter, EMB-505 Charter, and a Phenom Jet Charter.